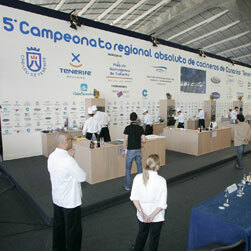 The only woman competitor in the fifth regional Canarian Chef of the Year competition, at the Tenerife Showground in Santa Cruz, beat all her male rivals to lift the award. Laura Nieto, who is originally from Galicia but has lived in Tenerife for eight years, was the outright winner of the 2-day event and picked up her award and €1500 prize money from the Cabildo’s vicepresident José Manuel Bermúdez. For the compulsory round the entrants had to prepared unusual dishes and to make it more interesting, they had to include vine leaves. Laura is chef at the Anthelia Hotel in Costa Adeje. Runner-up was Germán Blanco from Lanzarote.